There are three types of fiber line lays: hawser-laid, shroud-laid, and cable-laid lines. Each type is illustrated in figure 4-2. 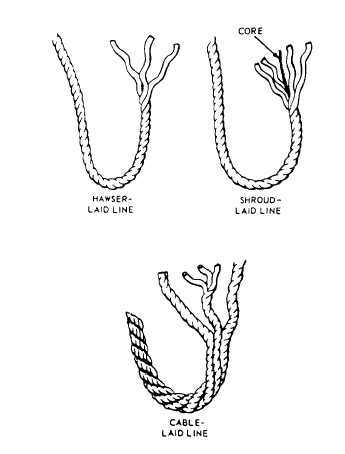 Hawser-laid line generally consists of three strands twisted together, usually in a right-hand direction. A shroud-laid line ordinarily is composed of four strands twisted together in a right-hand direction around a center strand, or core, which usually is of the same material, but smaller in diameter than the four strands. You will find that shroud-laid line is more pliable and stronger than hawser-laid line, but it has a strong tendency toward kinking. In most instances, it is used on sheaves and drums. This not only prevents kinking, but also makes use of its pliability and strength. Cable-laid line usually consists of three right-hand, hawser-laid lines twisted together in a left-hand direction. It is especially safe to use in heavy construction work; if cable laid line untwists, it will tend to tighten any regular right-hand screw connection to which it is attached. Figure 4-2. - Time type of fiber line. Line that is 1 3/4 inches or less in circumference is called small stuff this size is usually designated by the number of threads (or yarns) that make up each strand. You may use from 6- to 24-thread strands, but the most commonly used are 9- to 21-thread strands (figure 4-3). You may hear some small stuff designated by name without reference to size. One such type is marline - a tarred, two-strand, left-laid hemp. Marline is the small stuff you will use most for seizing. When you need something stronger than marline, you will use a tarred, three-strand, left-laid hemp called houseline. Line larger than 1 3/4 inches in circumference is generally size designated by its circumference in inches. 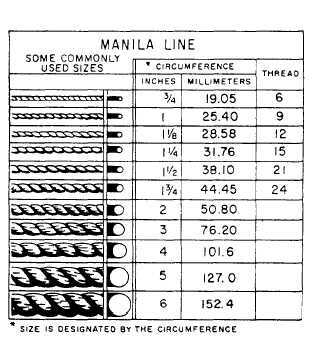 A 6-inch manila line, for instance, is constructed of manila fibers and measures 6 inches in circumference. Line is available in sizes ranging up to 16 inches in circumference, but 12 inches is about the largest carried in stock. Anything larger is used only on special jobs. If you have occasion to order line, you may find that in the catalogs, it is designated and ordered by diameter. The catalog may also use the term "rope" rather than "line." Figure 4-3. - Some commonly used sizes of manila line.